Close ups of three works currently on view in the Made in the USA exhibition. Can you guess which works these three detail shots are from? Leave your answers in the comments. Left detail hint: this work is on view in the Abstract Expressionism gallery of Made in the USA. Center detail hint: This work has a numerical title. Right detail hint: This artist’s last name is also a beloved bird. 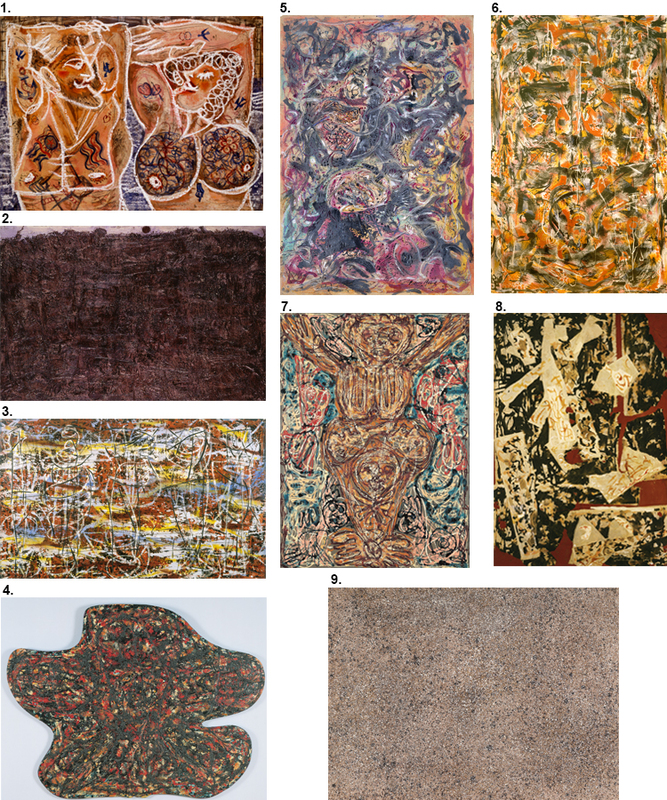 Artists Jackson Pollock, Alfonso Ossorio, and Jean Dubuffet forged a fascinating friendship and transcontinental artistic dialogue, borrowing and exchanging techniques from each other as they experimented with their individual styles. Angels, Demons, and Savages highlights this exchange. Upon entering a room in the exhibition, you may find it hard to tell which artist painted which canvases. Test your knowledge: can you identify which artist painted each of the below works from the exhibition? Answers after the jump. Can you match each image with the artist who created it?